Landscape of relatively small irregular fields with hedge boundaries on steep western slopes of the Clwydian hills. 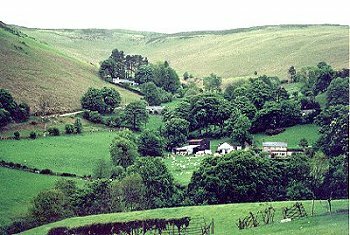 The area falls partly in the medieval ecclesiastical parish of Llandyrnog and partly in the parish of Bodfari, and towards the northern end of the commote of Dogfeilyn, in the ancient cantref of Dyffryn Clwyd. The earliest evidence of human activity in the area is given by a prehistoric battle-axe found in walling at Fron-vox. The area runs along the steep lower slopes of the Clwydian hills, rising from a height of about 100m above OD, just above the lower lying ground in the valley bottom, to a height of over 300m along the moorland edge, the eastern side of the area forming part of the Clwydian Range AONB. The area is broken by occasional deeply cut streams, lined with taller alder, ash and oak trees. Settlement is confined to scattered farms and roadside cottages on the spring-line close to the moorland edge and others at about mid slope, roadside farms often having drystone roadside walls. Traditional building materials include timber-frame construction with brick infill in present outbuildings at Fron-vox, and quarried local slatey stone in the sub-medieval house at Gelli and the 18th-19th-century or earlier farmhouses, houses and outbuildings at Fron-vox, Fron-gelyn, Castell and Ty Newydd, though an early outbuilding at Dregoch Ucha is built of rounded boulders probably resulting from field clearance. Late 19th- and 20th-century buildings are typically rendered with brick detailing and in the case of the farmhouses at Dregoch Ucha and Bwlch Isaf. Some farms and farmhouses have been abandoned and represented only by ruins, as near Aifft, where there is a small group of houses and small farms including a former small brick chapel, clustered around the head of a stream valley which provides access onto the Clwydian hills. Relatively small irregular fields defined by multiple species hedges of ash, hawthorn, holly, often set on lynchets, and scattered larger ash and oak trees. Many hedges are tall and overgrown out and often several fields are now run into one. Some old field boundaries represented by lynchets. Occasional large erratic glacial boulders in fields or moved to field banks. There are a number of wooded areas classed as ancient semi-natural woodland along some of the steeper slopes and down some of the steeper-sided streams, including Coed Nant Simon, Coed Pen-llwyn and Coed y Gelli, with an area classed as ancient replanted woodland at Wern-fawr. A number of place-names indicate the former prevalence of woodland or scrub: Fron Banadl (broom), Fron-gelyn (holly), Gelli (wood), Pen Llwyn (grove). Towards the upper margins of the area, along the moorland edge, appear to be a number of late enclosures and encroachments with large field banks and lynchets, some with grown out hedges now represented by scattered larger trees and shrubs. The landscape seems to represent a combination of piecemeal late medieval and early post-medieval woodland clearance and enclosure on the lower-lying ground and possibly 18th- and 19th-century encroachment of the upland common. An upper road running along the contour of the hill meets various lanes running steeply uphill in deep hollow-ways, some of which are revetted in stone, former streams which would formerly have followed the hollow-ways are now culvetted below the road. Trackways and footpaths onto the Clwydian hills either take advantage of stream valleys or cut diagonally across the contours. A quarry and shaft near Pen-llwyn appear to represent small-scale 19th-century lead trials or workings. The only ecclesiastical structure appears to be Castell Chapel, a 19th-century brick chapel now converted to a house.